The brass gears manufactured by swadeshi gears use quality brass and have diverse applications in micro-motors and geared motors. They are extensively used in the micromotor industry. The company also has various standard gears to suit diverse applications. We focus on giving soundless gears for long life and smooth running. Apart from micro motor gears, the company also manufacturers brass gears for various custom applications like camera industry, flow meters, etc. Backed by a team of skilled engineers, we are highly engaged in manufacturing and supplying quality assured Speedometer Gears. The offered meter gears are developed with the help of finest quality material and advanced tools under the management of accomplished professionals. 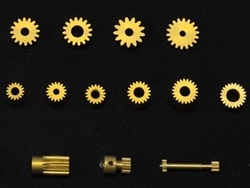 Swadeshi Gears manufacturers Brass Gear for noiseless applications. Brass gears are used in micro motors and also areas where the smooth long life of gears is required, These are anti-rust, and also have high strength as compared to plastics.